Two beautiful girls named Breanna and Chayyen had wishes granted by their OFW father not knowing the way they expected it to be. Based on a Facebook post by Jun P. Montaner, he told that it had been 3 years ago since the last time that they have seen each other. The OFW father is working in Dubai as a nurse while their mother works in Bohol with the kids. The two siblings have been through struggles and hardships at a very young stage. They experienced an earthquake in their hometown Bohol and became one of the many victims. At an instance, they need to stay with other family members in Marawi City which made them 10 long hours travel to break free from military's combat area. One of the daughters named Yenna (Breanna), turned 8 last November 20, 2017, wished her family to be united again, if not on her birthday, it can be possibly granted to her as a Christmas gift. She quoted: " Mommy Juv, I will pray million times because Daddy told me he might come home." 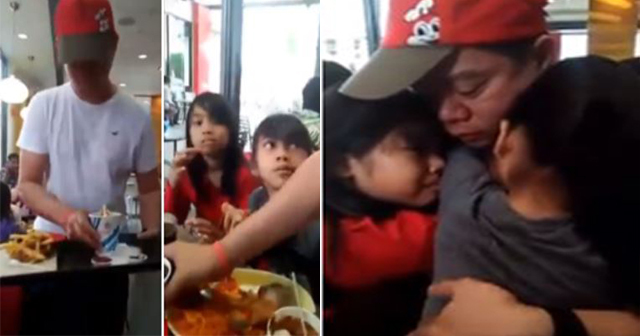 One day, the father secretly called her daughter's uncle and asked for help in giving unexpected meeting with them and detailed to wear one of the leading fast-food chain's uniforms, Jollibee. Fortunately, the manager of Tubod Ros Heights has permitted him to wear a Jollibee cap concealing the person who he is and act as one of the crew members. As most of the children do, Breanna and Chayyen excitedly want to grab their ordered french fries once it was put on their table. They didn't notice their dad. But Yenna recognized the man's bracelet as it is the same as what they sent to Dubai for their father. Even if it's not that audible, we can see on the video the child surprisingly says, "Daddy!" And from that moment on, it was emotionally full of hugs, tears, and kisses around. Based on the post, the bracelet served comfort for his longing to his family and made him decide not to take it off anytime. Even though the father had missed his them for a long time and desired to hug his daughters soon as he saw, he distinctly remains in character. Tears are now on my face.